If you’ve never eaten Turkish eggs before you might wonder what all the fuss is about, its just poached eggs and yoghurt is it not? Well it is way more than that, and that is what makes this simple dish even more exciting. Getting so much flavour into the yoghurt and the combination of the soft runny egg and chilli butter means that you will be using your bread to sponge every last bit of it out that your bowl will be sparkling again by the end of it. 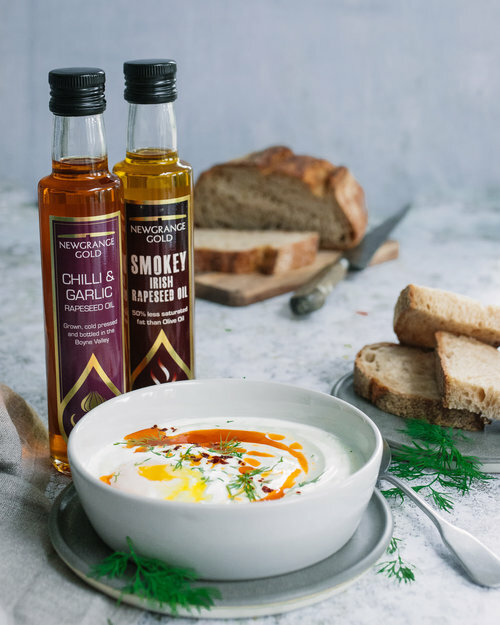 Traditionally it would be made by adding just garlic and salt and pepper to the yogurt, but this is where our addition of our Newgrange Gold Smokey Rapeseed Oil really brings a whole new dimension of flavour. That along with the Chilli & Garlic drizzle using our Newgrange Gold Garlic & Chili oil means that with even something that seems simple at first glance can have you not wanting it to end. So although this recipe says it serves two our top tip is that after you try it you mightn’t want to share it. Poach the eggs by gently cracking into a pan of just-simmering water. Leave for 2-3 minutes then remove with a slotted spoon. Divide the yoghurt mixture between 2 bowls. Add an poached egg to each bowl and then drizzle over the Garlic & Chili oil mixture. Serve with toasted sourdough for dunking.